Can't attend one of these events? Schedule an individual visit. Sign up for an upcoming Campus Visit Day event. Sign up for an upcoming Student for a Day event. What are the Advantages of Attending An Event? Earn Tuition Credit: By visiting our campus you will receive a $500 tuition credit towards your first trimester in the Doctor of Naturopathic Medicine Medicine program. Visit Day Benefits: You and your guests can watch engaging demonstrations, tour our facilities, participate in student and alumni panels, and enjoy a complimentary lunch. You will also have the opportunity to speak with knowledgeable representatives from Admissions and Financial Aid. Student for a Day Benefits: Sit in on a class lecture, tour our facilities, enjoy lunch with students and faculty, and meet with an admissions representative. 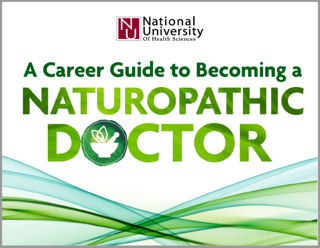 A Career Guide to Becoming a Naturopathic Doctor is an informational guide for those that are considering pursing a graduate program in naturopathic medicine. We hope this guide will bring you real insight as you consider an exciting career as a naturopathic physician.